Vested interest in financial bubbles is common in all levels of a society. Nobody wants to tell you the party isn’t real or no one wants to send to jail the drug lord that is paying the community off. An inflow of excess revenues and keeping the people happy is a good thing for American politicians. Government clearly hasn’t been the efficient police cop in telling you when we are in a financial bubble. In a span of less that 20 years we have now 3 financial bubbles. First, the stock market technology bubble of the late 90’s. Second, the real estate bubble of the last decade. Like a drug addict the US government needs the bubble revenues to pay for its bloated budget. His logic is clear and his points were direct. 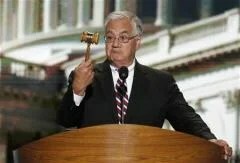 Posted in Uncategorized and tagged Barney Frank, Financial Bubble, Housing Bubble. Bookmark the permalink. update your blog, how’s business, what’s going on, better, worse or the same.